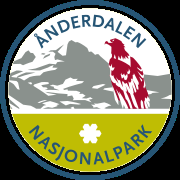 Ånderdalen National Park (Norwegian: Ånderdalen nasjonalpark) is located on the large island of Senja in Troms county, Norway. The 125-square-kilometre (48 sq mi) park lies within the municipalities of Torsken and Tranøy. The park was established by royal decree on 6 February 1970 and it was enlarged in 2004. The national park preserves this Northern Norwegian coastal region in a natural state, including pine and birch forest and alpine plants.